EUREKA —Methodist College and Eureka College are partnering to offer Eureka students the opportunity to pursue a major in social work. Eureka College President Dr. Jamel Santa Cruze Wright and Provost Dr. Ann Fulop, along with Methodist College Chancellor Dr. James R. Dire and Provost Dr. Deborah Garrison recently gathered in the Rizagio Conference Room of the Donald B. Cerf Center at Eureka College to make it official. 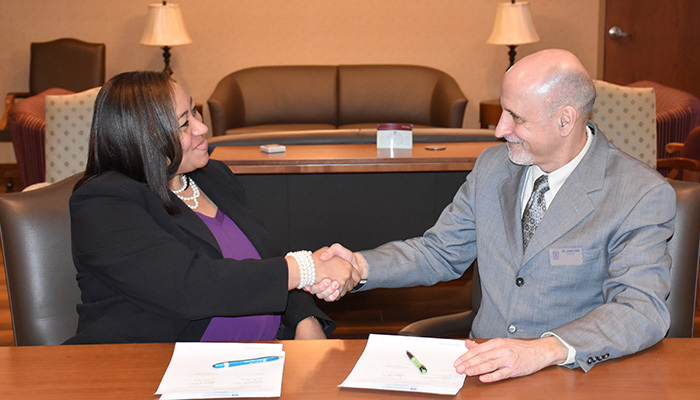 The articulation agreement signed by the college administrators will allow students to take Eureka College and Methodist College social work courses at Eureka for two years, before matriculating to Methodist College to finish their Bachelor of Social Work degree. Students will have up to seven years to complete the program once they have been admitted to Methodist. At Eureka College, students in the program will have the option to participate in co-curricular and extracurricular activities that are not available at Methodist such as athletics, choir or Greek life. This arrangement allows students to explore social work as a career during their first year at Eureka and readily change to another major if they decide it does not suit them. This is the second cooperative “2+2” agreement between the two college. Administrators previously signed a similar articulation agreement in June 2017 that put a shared nursing program in place. Methodist College initiated its Bachelor of Social Work program in fall 2017. The Bachelor of Social Work program is approved as a Candidate for Accreditation through the specialized accreditation offered through the Council on Social Work Education. Photos by Blake Baxter/Eureka College. 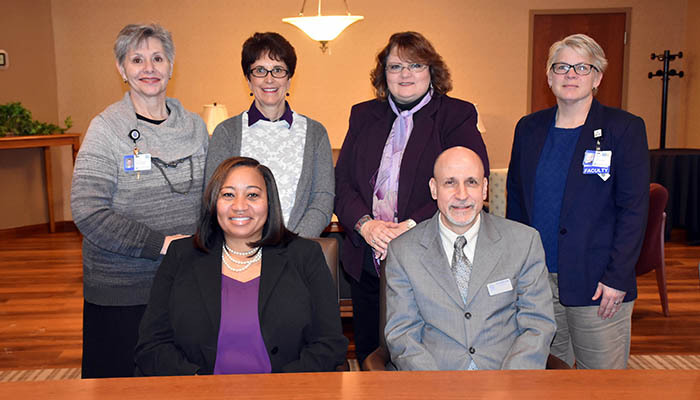 Eureka College and Methodist College administrators pose after signing the 2+2 Social Work Program Agreement at Eureka College on Friday afternoon. Back row: Dr. Pam Ferguson (Methodist Associate Provost/Dean of Nursing and Health Professions), Dr. Ann Fulop (Eureka College Provost), Dr. Deborah Garrison (Methodist Provost and Vice Chancellor for Academic Affairs), Dr. Staci Wolfe (Department of Social Work Chair and Program Director). Front row: Dr. Jamel Santa Cruze Wright (Eureka College President) and Dr. James R. Dire (Methodist College Chancellor).